The one thing that almost every poker player is interested in when they begin seriously playing the game is how much money they can make. The top pros and tournament winners are making hundreds of thousands or even millions of dollars a year, where as the majority of uneducated players (often referred to as “fish” by more experienced players) are losing anywhere from a little bit of money to a whole lot of money. But if you’re doing research on how much money you can make playing online poker, then you likely are not a top professional, and hopefully you are not a fish. 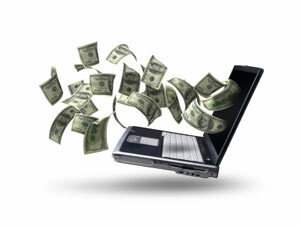 Can you make Money playing online poker and how much can you expect to win? The first thing that affects how much money you’ll make is what stakes you play at. All other things being equal, you can make more money the larger games you play. It’s obvious that a game with $10-$20 blinds has more opportunity to win money than a game with $0.01-$0.02 blinds. Unfortunately, all things aren’t equal and the games get harder the as the stakes get larger. Being able to beat the micro limits is no guarantee that you can beat the bigger games. Normally it is a case of finding a happy medium. A good stake level to aim for is $1-$2 No Limit Holdem. Tables at that level are usually tough but beatable. Many players are able to beat the games with a strong win rate while multi-tabling 5 to 20 different tables. If you are going to play $1-$2 NL Texas Hold-em, you need a bankroll that can support playing at that level. A common piece of advice that we give out is to always buy in for the table maximum. You might not be the big stack at the table, but you will be in a position where you won’t be easily bullied. The table max is usually 100 times the big blind, so a single table buy in would be $200. Even if you are a winning poker player, you won’t win every single table you play. You will go on some winning streaks and some losing streaks. You will need a bankroll large enough to ride through a losing streak. If you have read our Introduction to Bankroll Management then you will know that for recreational players we recommend only sitting down with 5% of your total bankroll so you would need 20 buy ins to play at a level. Therefore to seriously tackle $1-$2 NL Holdem you would need a bankroll of $4,000 (20 x $200). You can get by with a smaller bankroll if you are willing to play with a higher risk of going broke, or are willing to fund your poker bankroll with cash from an outside job if you lose your initial bankroll. If you multi-table you may need more than 20 buy ins to protect yourself from inevitable swings. Playing a large number of tables helps even out the fall of the cards, but it exposes your bankroll to problems with your play. If you have a 20 buy in bankroll, and in general you play 10 tables at once, you could blow 50% or more of your bankroll in a single night. You need a large enough bankroll to protect you from runs of dead cards, as well as streaks of bad play. A good rule of thumb is that you should have 20 buy ins, or 4-5 times the amount you play at a single time, which ever is more. Thus if you play 10 tables at one time, you should plan on having something like 40 buy ins (4 x 10) to protect yourself from going broke. Think of Poker Cash Games as the normal job where you are paid by the hour and earn a certain rate per hour. In contrast playing Poker Tournaments is more like a salesman job, where you work for free (or very little) per hour but earn a lump sum every time you land a big sale (or Tournament win). The single statistic that is most important to cash game players is the amount of money they win per hour. If you are treating poker like a job, and using that money to pay for expenses, then you want to get paid for the time you put in. In live poker a good hourly rate was considered to be 1 Big Bet per hour. 1 Big Bet = 2 big blinds. The concept of a big bet is from the old limit version of poker and is equal to two big blinds. In online poker a player sees many more hands per hour. A full ring (cash) game online deals 60-80 hands per hour, compared to approximately 20 in a live human dealt game. Additionally online poker players can play more than one table at once. Multi-tabling drastically increases the number of hands you play, and can increase your win rate. Because of this, hourly win rate for online players is usually reported as BB/100, or Big Bets per 100 hands (occasionally as bb/100, big blinds per 100 hands). At $1-$2 limits, 3 BB/100 is considered good, but achievable, for a multi-tabler. 3 BB / 100 = $12 / 100 hands. If you assume you are seeing 65 hands per table per hour, this means a good hourly win rate for $1-$2 No Limit Texas Holdem is $8 per Hour per Table. $8 per hour does not add up to a lot of money. The best way to increase that is to play more tables. Many people are able to successfully play 4 tables simultaneously. Some play 8-12 tables, and a few people claim to beat the game while playing 20 or more tables at the same time. If you can win $8 / table / hour across 4 tables, you would be looking at earning $32 / hour. Do that across 10 tables and you are up to $80 / hour. The other big variable is how much time you spend per week playing poker. If you play 10 hours / week @ $80 / hour then you can earn $800 / week. If you play 40 hours per week it could be $3,200. Software Tools such as Poker Tracker can greatly increase your ability to win playing multiple tables. Instead of having to remember how each of your opponents play, you can see their stats in a heads up display above their name. Find out their aggression to see if they are bluffing, or their steal rate to see if they are trying to take your blinds. If you are determined to give making money at online poker a serious shot, tools like Poker Tracker can pay for themselves in no time. Poker is often described as a hard way to make an easy living. Although $3,200 a week is a lot of money, not every one can do it. To win that kind of money, not only do you have to be able to beat the other players, you have to be able to do it while splitting your focus and playing for hours on end. Many poker players, after they have tasted the success of winning, have found that playing 40 hours of poker a week just isn’t sustainable for them. It is difficult to make good decisions hand after hand for that many hours. If you play too long and lose your edge, you can find yourself giving back the money that you won earlier in the day. So if you want to try and make money playing poker, you need to find a system and schedule that works best for you.